This is a interesting idea and concept for using solar to heat a home. You would be right though with regards to the amount of effort to keep the panels on track with the movement of the sun. 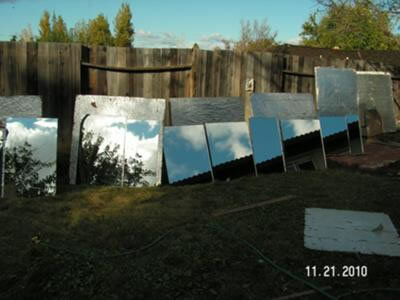 I too have used some of my parabolic cookers to direct sunlight into our home when they are not being used to cook. I did this more with the intention of lighting the room up more than heating it. If you have enough panels you could probably give a pretty good amount of heat to your house wall. I also have used my parabolics for hand warming up in the mountains while camping, of course this was the offset concentration of the suns rays, not the direct concentration...too hot. Comments for Solar Cook Your Home!!! In the Photovoltaic class i took at college one of the tracking systems used was simply an array mounted on a pole with piping around the outer edge of the array and filled with refrigerant. the way it worked was as the sun came up it heated the tube closest to the sun causing the refrigerant to change to gas as it did the liquid would sift toward the sun side as the gas formed then as the sun rose it would level back out and repeat the opposite as the sun set. really neat system with no power requirement. hope this helps.